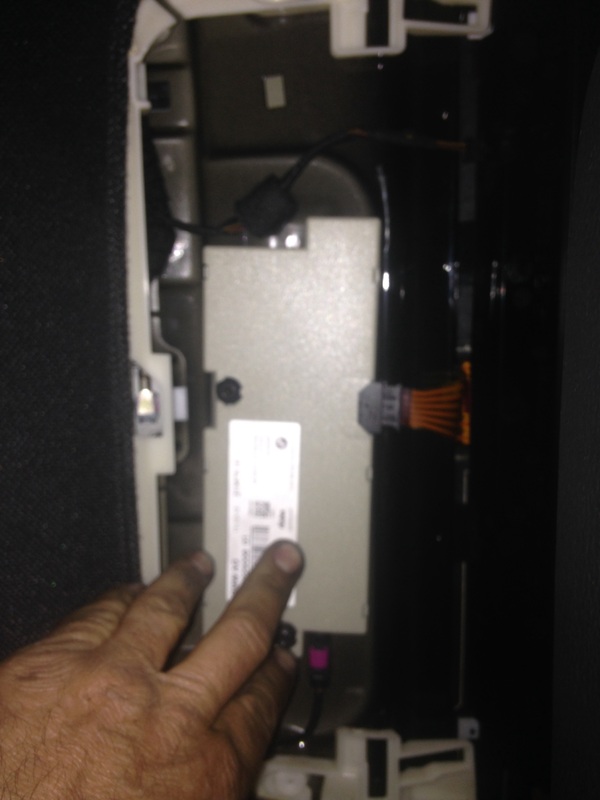 This is a picture of the antenna diversity on a F10,,,,the antenna diversity is sitting just behind the third brake light,,,,on some other cars it sit inside the rear trunk area or on the rear trunk inside lid,,,,the customer was complaining about both key remotes won’t lock or unlock the car,,,,and the car will not Identify the key remote,,,,the only way to start the car was to hold the key remote up to the side of the steering column,,,,during the test I first tried new key remote battery,,,that didn’t work to easy,,,,tried BMW test plan and they said both key remotes were bad,,,,will I thought what are the chances both key remotes are bad at the same time,,,,not likely,,,,while holding the key remote up to the steering column the keys would identify the VIN number of the car,,,,,so I knew the key remotes were good and the CAS was ok,,,I had a antenna issue,,,I checked the interior antenna which is behind the ashtray,,,,,that was ok,,,,I finally tried a new antenna diversity which controls all the smaller antennas and sends the signal to the CAS and the JBE units,,,,good new no programming or encoding for this unit,,,,,just plug and play. This entry was posted in Uncategorized and tagged antenna, diversity, F10. Bookmark the permalink. Thanks for the hint where the diversity antenna (I always thought, it was more an antenna amplifier, correct?) is located. I´m quite sure it´s responsible for my issues regarding my not working key remotes. But how did you check the “ashtray antenna”? And do I have to to remove the batterie before installing the new diversity antenna? Sorry for my missleading question and thanks for the quick replies. I´m from Germany and English is not my mother tongue… I meant, if I had to disconnect the battery, but I just had a call with my car mechanic, he told me it´s not necessary to do that. I usually plug in a new antenna and see if that fixes my problem,,,,you could swap a different antenna with the ashtray one and see if that fixes your problem.